Umpire John Libka makes his MLB debut during Saturday's Tigers-White Sox game in Chicago, joining Tom Hallion's crew for two games of the DET-CWS doubleheader, serving as first base umpire alongside HP Umpire Nic Lentz, 2B Umpire Tom Hallion, and 3B Umpire Phil Cuzzi for Game 1, and as third base umpire alongside HP Umpire Vic Carapazza, 1B Umpire Hallion, and 2B Umpire Cuzzi for Game 2. Libka is on the Pacific Coast League roster for the 2017 season, which is his second season in the PCL and second overall in Triple-A (2016 PCL). He has also worked the Gulf Coast, New York-Penn, Midwest, Florida State, Eastern, and Arizona Fall Leagues, in addition to MLB Spring Training. Libka wears the uniform number 84 at the Major League level, which was last worn by Angel Campos, and makes his MLB debut at the age of 29. 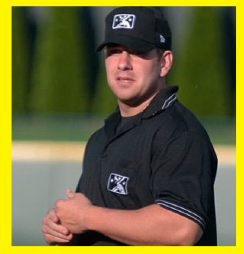 He resides in Port Huron, Michigan, instructs at the Wendelstedt School, and is the second new fill-in umpire to make his debut during the 2017 regular season (Ryan Additon, 5/21/17). Both Libka and Additon officiated the 2017 AFL Fall Stars Game. Libka most recently worked the plate for Wednesday's PCL matchup between the Las Vegas 51s and Round Rock Express in Round Rock, Texas; The first game of Friday's originally scheduled doubleheader in Chicago was postponed due to wet field conditions.